VFFS Machine for Free flow powders such as coffee, tea products, spices like turmeric, chilly, spices powder, flours like Wheat, Maida, Besan Powder, Skimmed Milk Powder, Tooth Powder, Herbal Powder, Talcum Powder, Distemper Powder, Glucose Powder, Chemical, Pharmaceutical, Pesticides, Insecticides, and semi solids like automobile & industrial greases, garlic paste, tamarind paste, ointments etc. VFFS Machine for free flowing Powder, Granules, Pulses, Beans, Spices, Soup Mixes, Detergents, Desserts, Pharmaceutical and Agricultural Powders, Tea, Coffee, Sugar, Rice etc. As a specialist in this domain, we are offering a commendable range of VFFS Machine. This machine is precisely manufactured making use of cutting-edge technology and utmost-grade components as per the set industrial norms. Before the final dispatch from our end, we stringently test the entire range against various parameters. Product Range Free and Non – free flowing Powder, Granules, Pulses, Beans, Spices, Soup Mixes, Detergents, Desserts, Pharmaceutical and Agricultural Powders, Tea, Coffee, Sugar, Rice etc. Pouch Size To Be Submitted With Purchase Order. Packaging Film Heat Sealable Laminate. tomation equipped machines with CE marked PLC and touch screen HMI. Its servo motor driven sealing system can effectively seal with pressure levels maintained. They have built-in safety door guards with machine-off interlocks and end-of-film roll with machine-parking mode interlock. It is programmed to pull the exact length of film required for packaging. 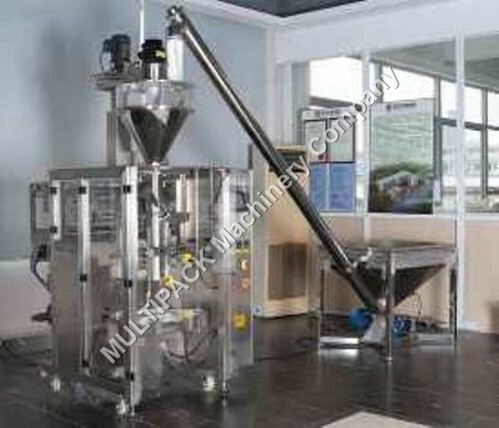 Bagger Speed (upto) 120 packs / min. 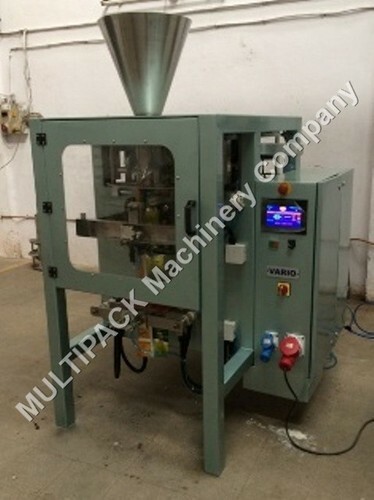 Looking for “VFFS Machine, VFFS Pouch packing machine”?